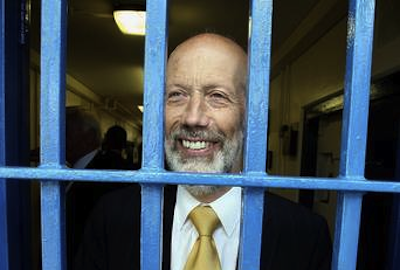 Yesterday David Ford rejected the suitability of a new body scanner for use in the prison estate based on a highly dubious report. According to the findings of the pilot the new technology was found wanting in the detection of contraband. The report claims the state-of-the-art equipment failed to detect items as varied as mobile phones, knives, drugs and pens secreted on the persons of members of the prison staff. A likely story, if you ask me. This report should be treated with extreme caution. The methodology employed raises serious questions as to the veracity of its findings. Screws who have been vigorously opposed to the ending of full body strip searches were used as guinea pigs to smuggle items on their persons for detection. All manner of contraband including, I presume, hand guns, AK47s, and RPG rockets passed through the scanner undetected. It would make one wonder whether the machine was switched on at all. How does a piece of modern technology fail so comprehensively to do the job it was designed to do? Surely the manufactures would have something to say about such claims. Or are we dealing with a conspiracy to subvert a perfectly good machine for ulterior motives? And so after six months of testing we are told that the new scanner is not fit for purpose. How then are we able to make our airports and ports safe for the general populace to pass through yet we are unable to do the same in HMPs? Either Mr Ford is incompetent or he is having a laugh at everyone’s expense. Are we really to believe in the modern age the great minds at the NIPS cannot come up with a workable solution to this problem? Perhaps we have the wrong people doing the job. Or worse: We are dealing with a bunch of luddites opposed to technological solutions to Victorian practices. Both ways the system is failing and all the prisoners suffer as the result. The upshot of this latest setback is that prisoner will endure more months of brutal and degrading treatment. By ending the protest it was hoped that Ford use the opportunity to expedite the pilot scheme and introduce the new systems. How wrong were we to expect such a common sense approach? In a sense we should not be surprised by this newest failure by the NIPS to do the right thing. The prison system has always been slow to change without the application of pressure. What now for the prisoners? I could go on to deal with the role of the politicians in all of this but I would not be telling people anything they do not already know. I think it best to end with my final question: What now for the prisoners? Not to learn for the past will lead to the same mistake being repeated in the future.